Humboldt County is basically glorious whatever the weather - gimme all of your soft greys, verdant greens, relentless downpours and oh those sunny days. Any other Humboldt Romantics out there? Yes, I am making t-shirts, I am a nerd and I was listening in English class. As anyone who has ever given a sidelong glance to the weather report so as not to draw attention knows, golden hour can be hit or miss since weather will do as weather will do, regardless of your shoot schedule. Yes, problems do exist that someone has yet to solve with the wonder of the internets. Fortunately, this Trinidad beach engagement session was verging on twenty-four karat. Champagne sunshine in all of your membranes and then some. Yes, I have a tendency with the hyperbole and no, I am not doing anything about it. Throw in this rad couple with a laid back sensibility and big love for this beautiful north coast and you've got my recipe for the ideal wandering beach engagement session. And let's not forget Reggie. The Romantic. The furious digger. The scene stealer. The incomparable. The ridiculously adorable. 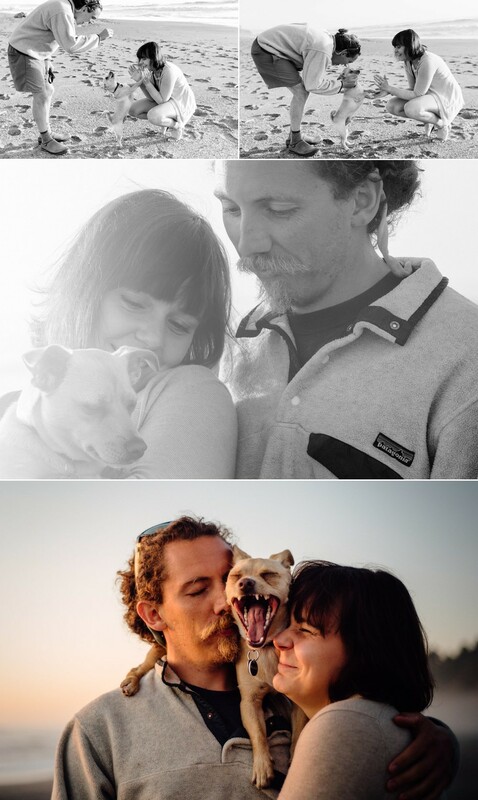 Future and present low key portrait fans, if you happen to have a dog who loves the beach and you don't love having your picture taken, by all means, bring that furry little lover with you! The best way to forget you're having your picture taken? Focus your attention on something much more entertaining (and adorable) than the camera.